The thread state specifies the current status of the thread. Sometimes, the thread automatically switches from one state to another state automatically; at some other times, you can switch its state by using the methods offered by Thread class. 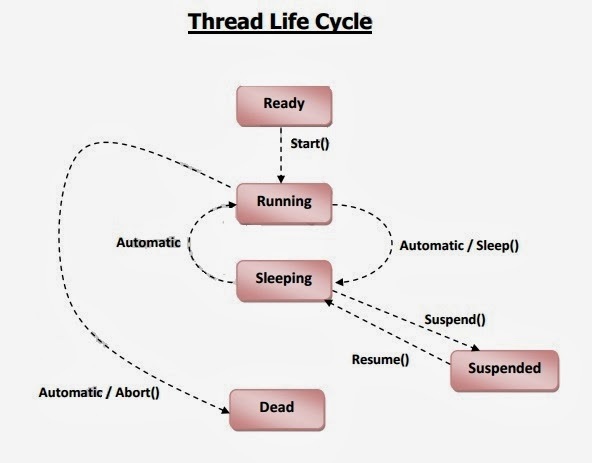 The following diagram called Thread Life Cycle describes the different states of a thread. Ready: This is the initial state. The thread object is created. Running: The thread is currently being executed. Sleeping: The thread is temporarily paused. .NET framework offers automatic switching between Running and Sleeping states, when other threads are executed. Suspended: The thread is temporarily suspended (paused). It will be continued, when you call Resume() method. Dead: The thread was closed; it can‘t be restarted or continued. thobj.Start() : This method starts-up the thread execution. Thread.Sleep(mille sec) : This method puts the thread under Sleeping state, up to a certain no. of mille seconds. When the given no. of mille seconds are completed, automatically the thread execution will be continued. thobj.Suspend() : This is similar to Sleep() method, but here, no time limit will be given. That means whenever the Suspend() method is called, the thread will be put under Suspended state, until the Resume() method is called. thobj.Resume() : This is to continue the thread execution that is under Suspended state. This method won‘t work if the thread is not under Suspended state.